I thought I'd share this video so that others (bloggers) may see it and share it...and, so that others (in the media) may understand that Ted Cruz knows who his friends are. He won't be utilizing the "mainstream media" during his campaign. Oh sure, he'll go on your shows and he'll answer your stupid questions and you'll twist his words and you'll make "news" out of your lies about him. He knows that well...already. In the end, he knows who will help him get out the TRUTH about his presidential campaign and his record. I know you're ready for it. It's time to "suit up". This video has 52 views on YouTube as of right now (since May 1, 2013). Share this blog post (or share the LINK to the video below) to help show the strength of the grassroots and BLOGGER support for Ted Cruz for president! 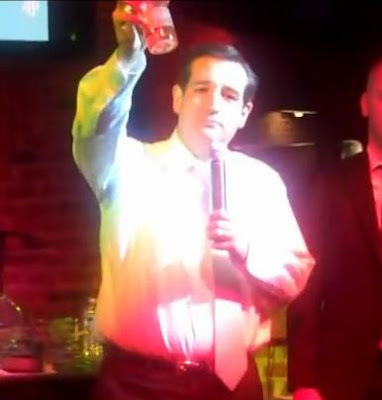 Um...I'll "have a beer with Ted Cruz" any day. I only say that because some people think that it is an important thing to claim - that they'd "like to have a beer with that guy" - someone with whom they stand NO CHANCE of EVER drinking with AT ANY TIME in their life. But, sadly, this is how some people choose their president. If you wish to be notified of my future blog posts, please subscribe to my blog via the “Follow by email” box near the top of this page.